I arrived in Dublin on 10 July, for a few days of Buffy sitting. It was more a case of Buffy playing and walking, and me being the ‘fetcher and carrier’ for Elly following her fall. George was away. She had damaged two ligaments in her foot, earlier in the week and was hobbling about on a crutch. I think she was ‘hobbling more than she should and not spending sufficient time with the leg elevated. Elly is very like her late dad. In his eyes he was never ill, so he kept on his feet and active if at all possible. She has learned the hard way, to listen to the pain warning, and rest the leg where possible. Thankfully she is able to carry on working from home. On Saturday Morning we got word of a death in the extended family. I am not often available to attend family funerals. But this time I joined my eldest brother, who offered to do the driving, (a 300+ mile round trip) and my sister and headed off from Dublin at 7am. 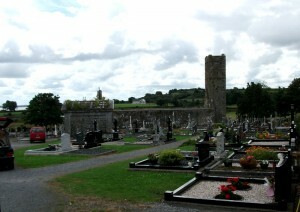 on Sunday morning, to bid farewell to one of our cousins, all the way over in County Clare, at the mouth of the Shannon. Once the funeral was over, we paid respects at the graves of our paternal grandparents, and three of our aunts. 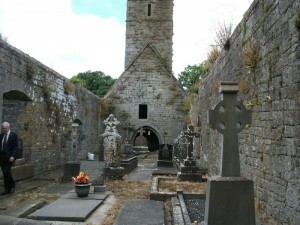 Family Graves within the walls of the old church in Kildysart. Then we joined the living for a meal and a catch up on all our news. We shared anecdotes and stories about the departed and news of other family members scattered across the globe. I returned to Elly’s for a few more days, and since George would be about, I moved to stay with my sister on Tuesday. I teased Eileen, that we had visited ‘the dead’ on one side of the family, and perhaps it was time we paid homage the maternal side. The days of deep mourning garb and widow’s weeds, have now thankfully almost disappeared. The old keening wakes with hushed whispers are now a thing of the past These days in death, we celebrate the lives of those who have gone before us with a more cheerful remembrance and plenty of laughter. It is the way it should be. 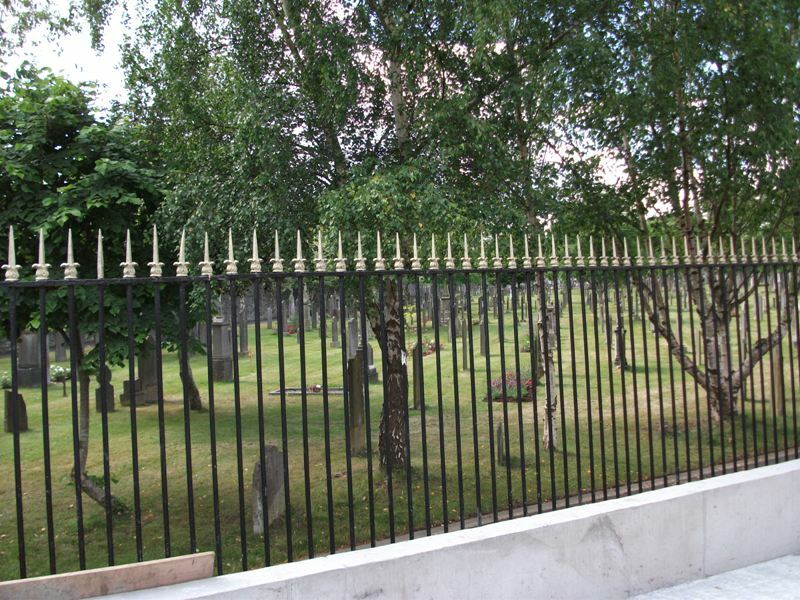 The suggested visit was really an excuse to visit the revamped Glasnevin Cemetery& Museum. 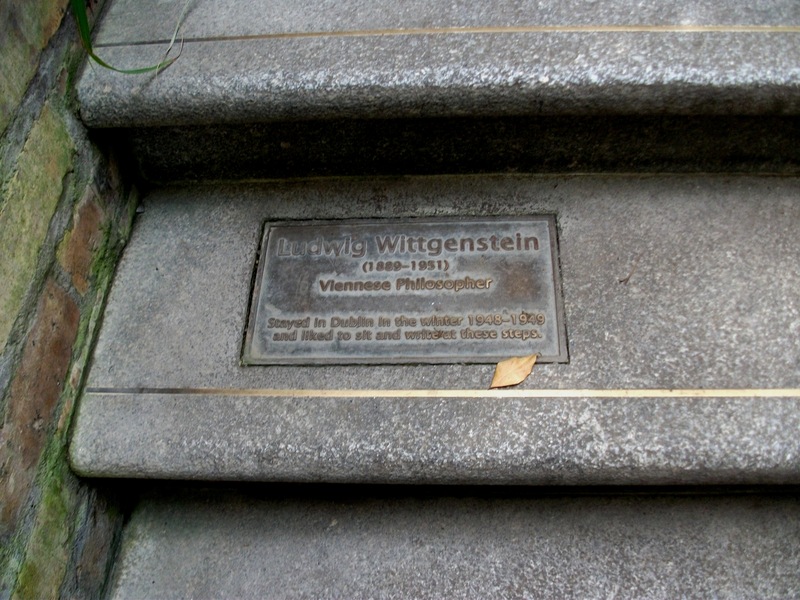 In my young days, Glasnevin or as the Dubs called it ‘The dead centre of Dublin’, was a dark and dreary place. It seemed all overgrown and shrouded in tall trees and would send shivers down my spine. The place we visited on Wednesday seemed a world apart from those memories. Check out the link above. It is well worth a visit. 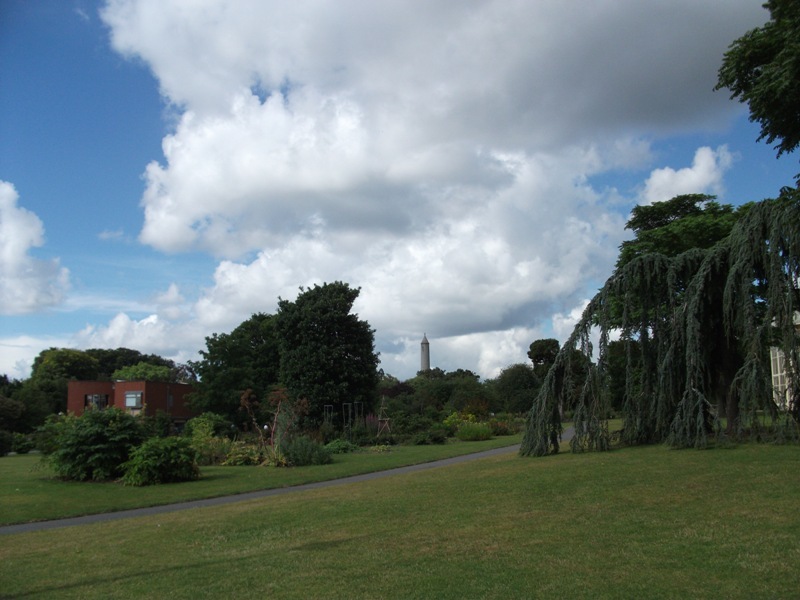 Glasnevin Cemetery is adjacent to and now accessible from The National Botanic Gardens. Both have busy coffee shops, though the latter has a wider selection for a more substantial meal. We had morning coffee in one and lunch at the other. We roamed so long that one of the grounds men that we had met several times on our travels through the graveyard, actually stopped his little van to say “Are you still here”? Later we wondered if he sent out a search party for us before the gates were locked for the night! I unfortunately somewhere along the line of my travels, contracted a bug, that swept away my energy, leaving my legs like jelly. I have no interest in reading or writing blog posts and each time I opened the laptop it was only for about five minutes. Thankfully the bug neither affected my tongue (for chatting) or my hands, so I kept myself busy. I finished the mysterious ‘cocktail stick’ project and decorated a hat. I’ll post the photos during the week….. when I have energy to sort them. Worry not, I am being well looked after and not allowed home until Nurses Hitler -Mark one and Two give me the go ahead! I am responding to good care and improving with every day. 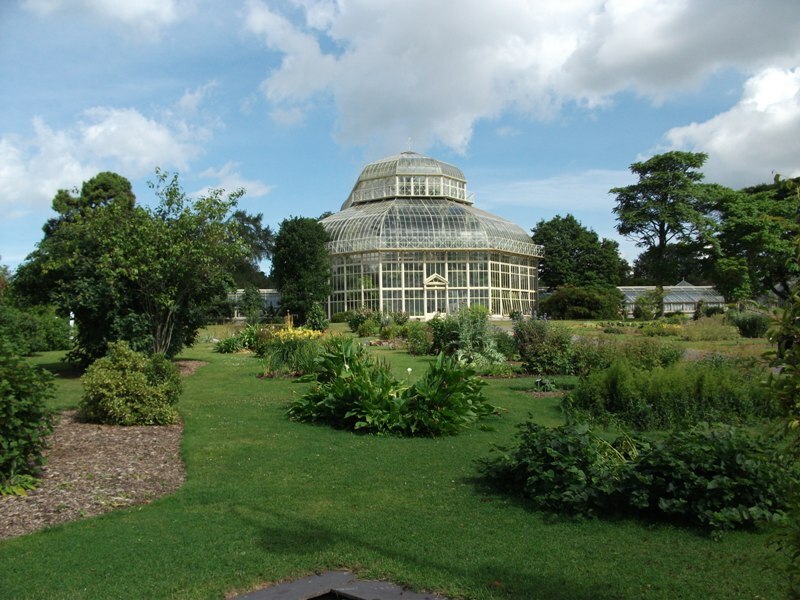 This entry was posted in Family and tagged Family, funerals, Glasnevin Cemetery& Museum, Kildysart graveyard, National Botanic Gardens of Ireland on July 19, 2014 by Grannymar. 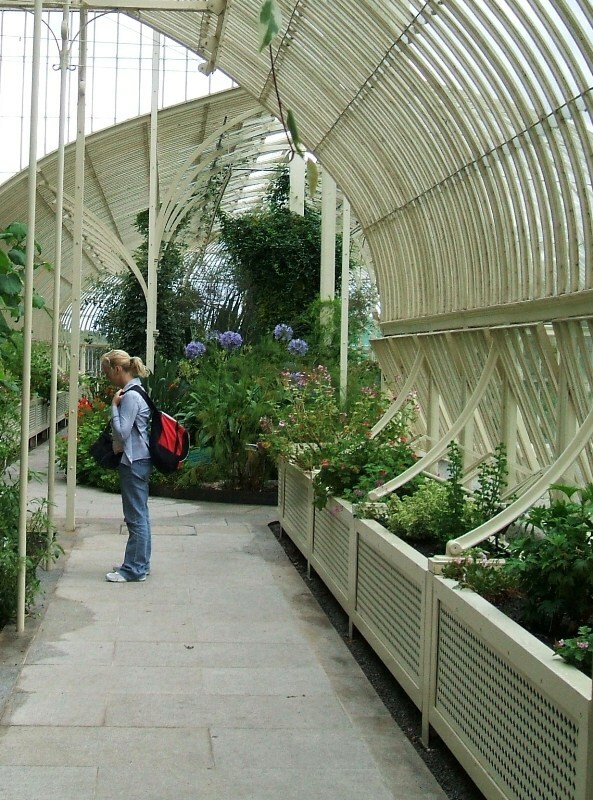 All part of a morning spent at the National Botanic Gardens of Ireland. The gardens are next door neighbours and a new entrance is being erected between the two. The Taxodiaceae Sequeiadendron giganteum, native of California rather dwarfed the Curvilinear Glasshouse. 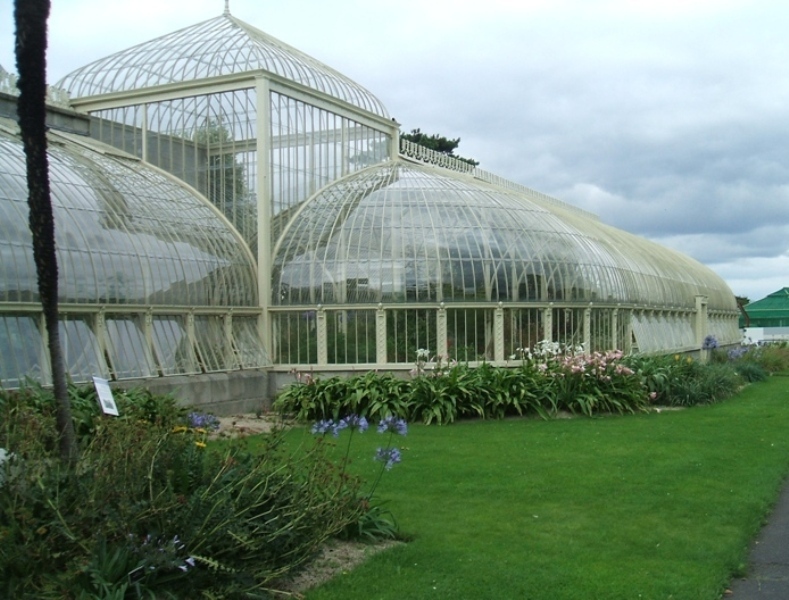 The curvilinear glasshouse was designed by Dublin ironmaster, Richard Turner in 1843. The work was completed and opened in 1849. It was extended in 1869. 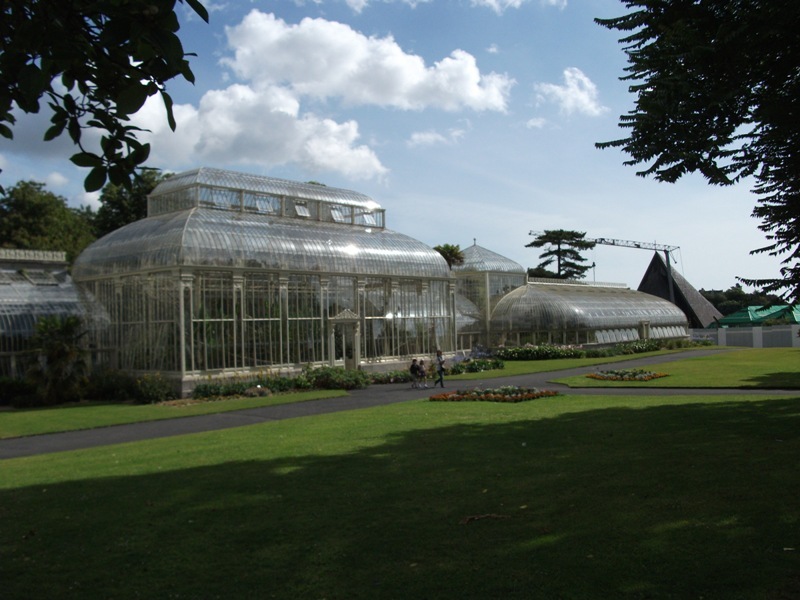 A major restoration began in 1992 and was completed with all 8,427 panes of glass in place, in time for the bicentenary of the founding of the gardens. 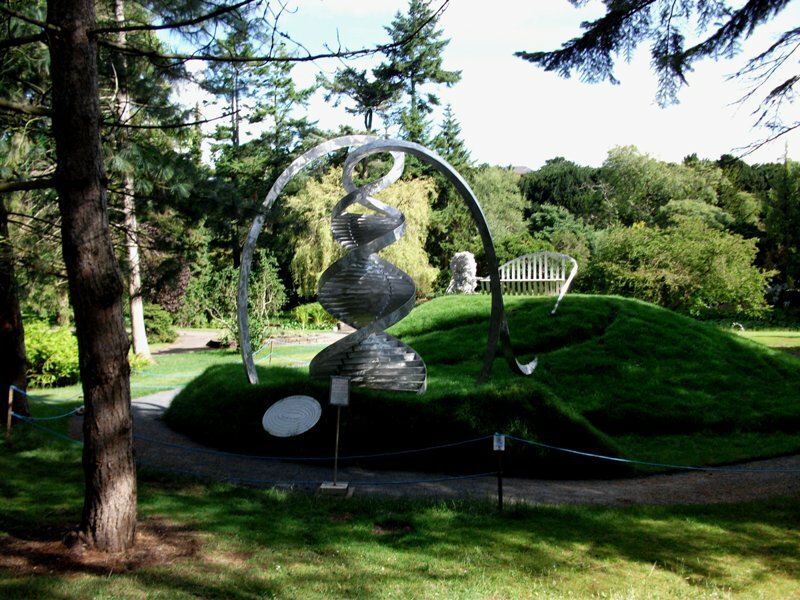 ‘What is Life’ was commissioned by Professors John Atkins of University College Cork and David McConnell of Trinity College Dublin as a public celebration of Science in Ireland and to specifically celebrate the 60th anniversary of the discovery of The Double Helix by Watson and his colleague Francis Crick in April 1953. 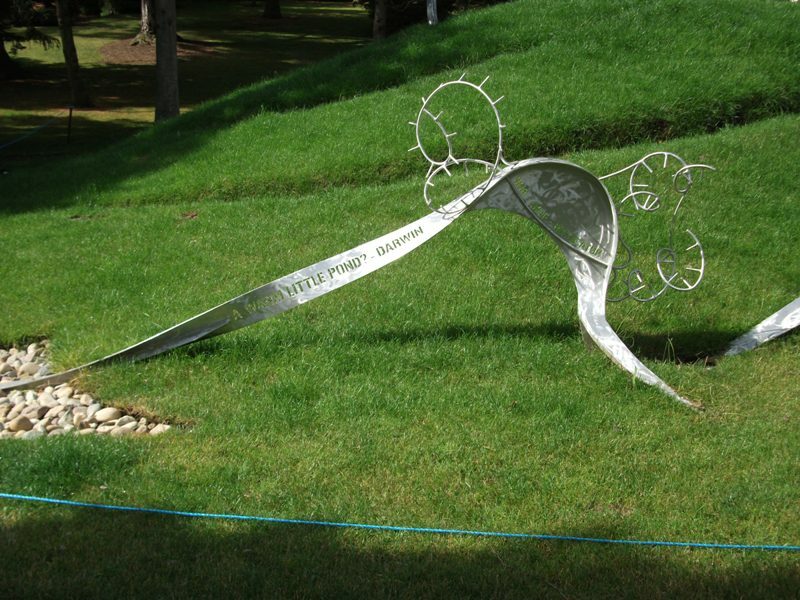 The Sculptor, Charles Jencks, designs landscapes and sculpture and writes on cosmogenic art. 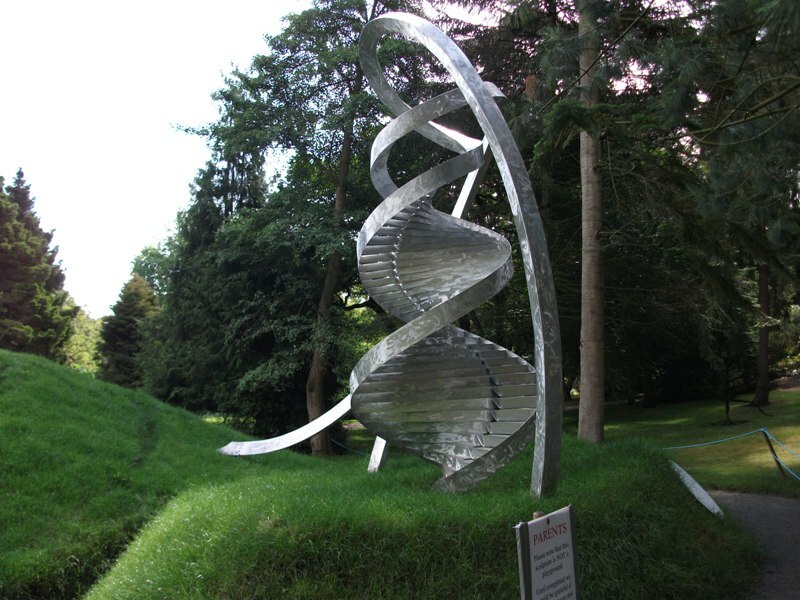 It represents for the first time in sculpture anywhere the many extraordinary new revelations made in the last 30 years about the novel roles of RNA in living organisms. 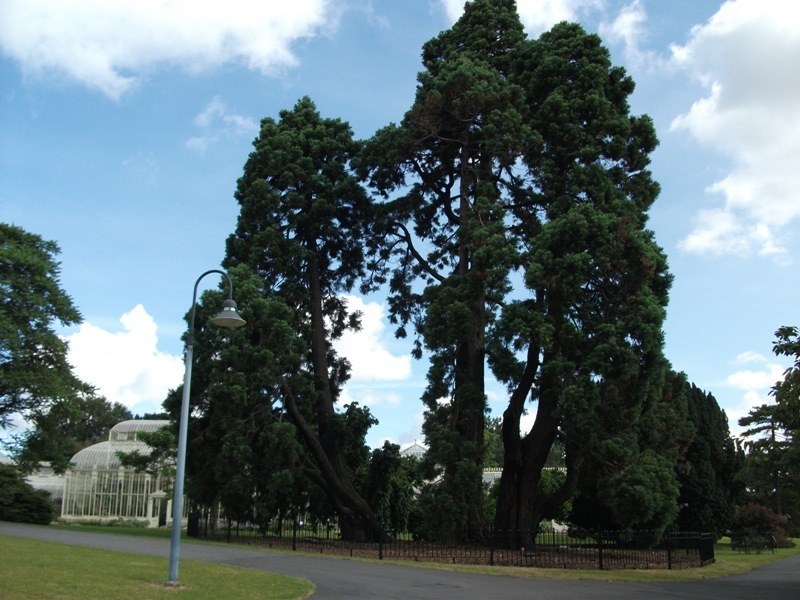 This entry was posted in Ireland, Photography, Sculpture and tagged Charles Jencks, Curvilinear Glasshouses, Daniel O'Connell, Glasnevin cemetery, National Botanic Gardens of Ireland, Richard Turner, round tower, Taxodiaceae Sequeiadendron giganteum on August 4, 2013 by Grannymar.